PROPERTY DESCRIPTION Three bedroom end of terraced property is offered with no onward chain, and is situated in a small cul-de-sac within the popular area of Decoy. Benefiting from a garage, off road parking and gardens. 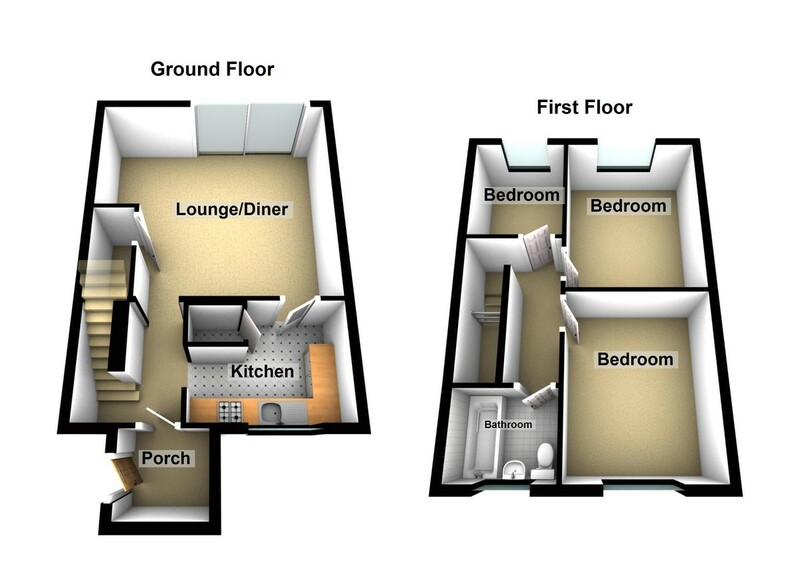 Ideally suited to family’s, First time buyers and investors. VENDORS POSITION The property is vacant and there will be no onward chain. LOUNGE/DINER 16′ 4" x 16′ 7" (4.98m x 5.07m) Leading from the hallway and kitchen, is a spacious room with gas fire, fitted units, understairs cupboard, and UPVC french doors leading to the rear garden. BEDROOM 3 7′ 10" x 7′ 10" (2.4m x 2.4m) UPVC window overlooking the garden. Space allowing a single bed. BEDROOM 2 9′ 10" x 11′ 10" (3.m x 3.63m) UPVC window with view of the rear garden. Space to accomadate a double bed. OUTSIDE From lounge patio door leads to: Half Wall & Fence panel wall and raised bed with mature shrubs. Level brick patio, gate leading to parking and row of garages. Garage has a yellow up and over door, parking for one vehicle. There is a selection of parking spaces shared with the surrounding houses. To the front of the property is a level walled garden laid level patio. An End of Terrace 3 bedroom property Occupying a level location, situated in the popular area of Decoy, providing excellent access to the main London Paddington Rail line, shops, Decoy school, Salisbury’s, and Decoy Country Park. Benefiting from garage, off road parking, and gardens.